Susan Aizenberg is the author of three poetry collections: Quiet City (BkMk Press 2015); Muse (Crab Orchard Poetry Series/SIUP 2002); and Peru in Take Three: 2/AGNI New Poets Series (Graywolf Press 1997) and co-editor with Erin Belieu of The Extraordinary Tide: New Poetry by American Women (Columbia University Press 2001). Her poems have appeared and are forthcoming in many journals, including North American Review, Prairie Schooner, Blackbird, Connotation Press, Spillway, The Journal, Midwest Quarterly Review, Hunger Mountain, Alaska Quarterly Review, the Philadelphia Inquirer, and Spoon River Poetry Review, and have been reprinted in several anthologies, among them Ley Lines (Wilfrid Laurier UP) and Wild and Whirling Words: A Poetic Conversation (Etruscan). 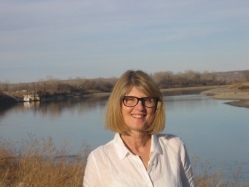 Fellowships and awards include the Nebraska Book Award for Poetry and Virginia Commonwealth University’s Levis Prize for Muse, a Distinguished Artist Fellowship from the Nebraska Arts Council, the Mari Sandoz Award from the Nebraska Library Association, and a Glenna Luschei Prairie Schooner award.